Neil Creek is located in the Rogue River basin of southern Oregon. It supports some of the most productive fishery habitat in the Bear Creek watershed. While home to threatened coho salmon and other wildlife, the creek’s riparian area was choked with invasive weeds. Livestock from a nearby ranch also had access to the stream year-round. Allowing livestock in streams increases the nutrients entering a waterway. An overabundance of nutrients promotes excessive plant and algae growth, reducing water quality and harming native species. Additionally, invasive weeds decrease biodiversity and crowd out native species. A healthy riparian area provides shade to keep water temperatures cool and stabilizes streambanks to reduce erosion. In 2015, The Freshwater Trust and its partners began working with an active ranch along Neil Creek to improve the conditions of the waterway. This project includes 14 acres of riparian restoration along approximately one mile of the creek. 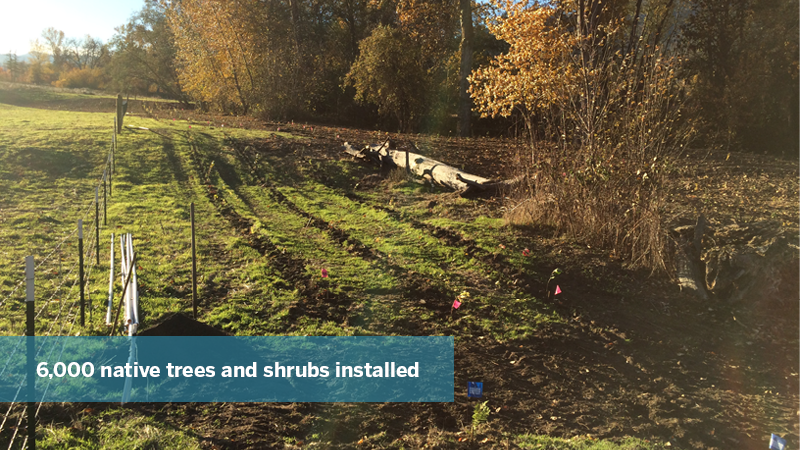 The riparian plantings include a mixture of native trees and shrubs to shade the stream, provide habitat for wildlife, and serve as a source of large wood and organic matter. 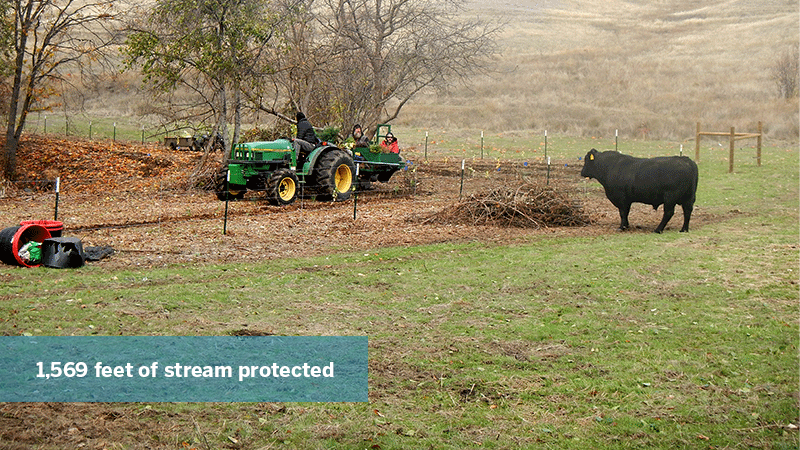 The project also includes fencing and watering troughs to exclude cattle from the stream. 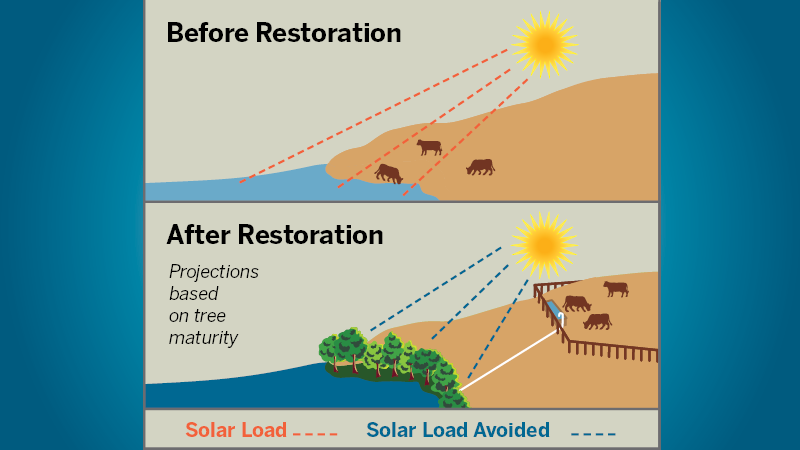 We used the Shade-a-lator model to quantify the reduction in solar loading on Neil Creek. We examined pre-project conditions, including current vegetation height, canopy density and plant distribution, to model the amount of solar radiation that reaches Neil Creek prior to the riparian plantings. We then modeled a post-project scenario based on mature vegetation height and abundance to determine the amount of solar radiation that will no longer reach the creek. The difference between the scenarios represents the uplift from the project: approximately 4 million kilocalories per day from July through August. Reducing solar loads helps improve stream conditions for aquatic species that depend on cold water to rear and spawn. This outcome-focused approach to conservation is a method we call Quantified Conservation. It’s about ensuring every action taken translates into a positive outcome for the environment. We also calculated nutrient and sediment uplift using the NTT model. This model considers on-farm drainage patterns, project designs, and farm management practices to determine nutrient and sediment uplift related to riparian restoration.